Sai Baba Mandir Najafgarh is a very divine place located in south west Delhi Najafgarh. It is one of the most visited temples of Najafgarh region. The large number of devotees regularly visit Sai Mandir Najafgarh. It receives the largest number of footfalls on every Thursday. Maximum number of devotees visit this divine place on Thursday. Devotees might also find a long queue in the Sai Baba temple during Hindu festive season, religious festivals and New year, etc. Sai Mandir Najafgarh timings are 5 AM to 10 PM. It opens 5 AM in the morning at 5 and closes at 10 in Night. Various types of Aarti are performed in the temple. First Aarti performs at 5.30 AM in the evening and last Aarti held in the night at 9.30 PM before the closing of the temple. 30 minutes to one hour time frame is required to visit the temple on Thursday and on normal days Darshan can be done in 10 minutes. On normal days temple remains empty with handful of devotees. Sai Baba Mandir Najafgarh is located in Indra Park on Najafgarh road just opposite to Delhi Metro Rail Corporation Depot. Sai Baba Mandir bus stop is the nearest bus stand located just outside the Temple. Bus number 728, 764, 783, 827, 817, 873, 848, 850, etc halts at this stop. Sai Baba Mandir Nearest Metro station is Dwarka Mor and Dwarka Metro station, which are around 3.5 KM from here. Every bus, which goes towards Najafgarh stops at the bus stand located outside the Najafgarh Sai Mandir. Delhi Metro is building a New section of Metro from Dwarka to Najafgarh and a metro station is under construction near to Sai Mandir. Shoe stall is located outside the temple at free of cost. Drinking water and hand wash facility is located outside the temple. Many Prasad shops are also located outside the temple. Prasad can be bought in various denominations like 11, 21, 31, 51, 101 Rs, etc. Mandir entry is completely free. A canteen is also located in the temple premises. Best time to visit the temple is morning time when the crowd is less as compared to other parts of the day. Many volunteers are working here for the convenience of visitors, especially on Thursday. Mobiles are allowed, however, photography is not allowed inside the temple. 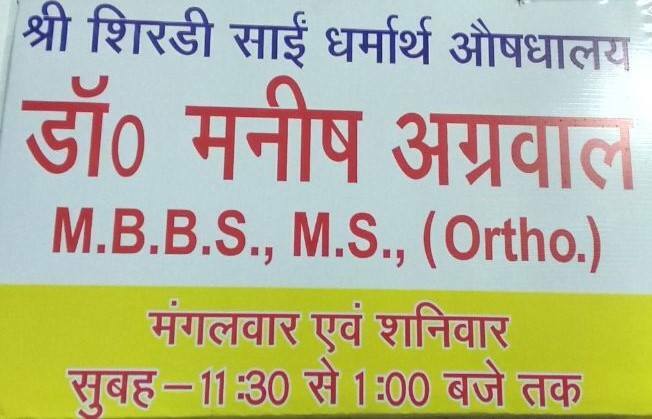 A charitable dispensary (Shri Shirdi Sai Dharmarth Ausdhalay) is located inside the temple premises and it provides general OPD in nominal charges. Dispensary opens in 9 in the morning and it works in two shifts. Please contact with the temple authorities before visiting to the temple. Health camps are set up are here for the visitors. Also visit Najafgarh Tura Mandi Hanuman Temple, Akshardham Mandir, Birla Mandir, Iskcon Temple, Hanuman Temple CP, Bangla Sahib Gurudwara, Chhatarpur Mandir, Kalkaji Temple, Jhandewalan Mandir, Sai Baba Temple Lodhi Road.